Step 1. Apply a black shimmery base to the lid. Step 2. Blend the base out with a grey eyeshadow. Blend until you get a soft smokey finish. Step 3. Next, apply a black matte eyeshadow to the inner and outer part of the eyelid, but avoid the center of the lid. Apply some of that black eyeshadow to your lower lash line, too. Step 4. With a flat eye shadow brush, pat a shimmery teal eyeshadow to the center of the lid. To brighten up the look, highlight the inner corner of the eye. Step 5. Line your waterline with a black pencil and apply false lashes. Step 1. Take a bright orange eyeshadow and start building it above your crease, and towards the inner corner. Step 2. Next, apply a dark brown eye pencil or eyeshadow to the lid and blend it upwards into your crease. Step 3. To make the look more smoother and smokey, use a small tapered brush and a chocolate brown eyeshadow and blend, blend, blend! Step 4. Using a patting motion, apply a burgundy brown eyeshadow to the lid. Step 5. Line your upper lash line with a black gel eyeliner and create an inner-corner cat eye. Step 6. Apply some copper glitter pigment onto your mobile eyelid. Step 7. Apply false lashes. Step 8. Tie the look together by applying the brown pencil from the step 2 along your lower lash line. Then, blend it out using the brown shade from the step 3. Apply mascara and go dramatic with some lower false lashes. Step 1. Start by applying a peachy eyeshadow to your crease. Use a soft and fluffy blending brush. Step 2. 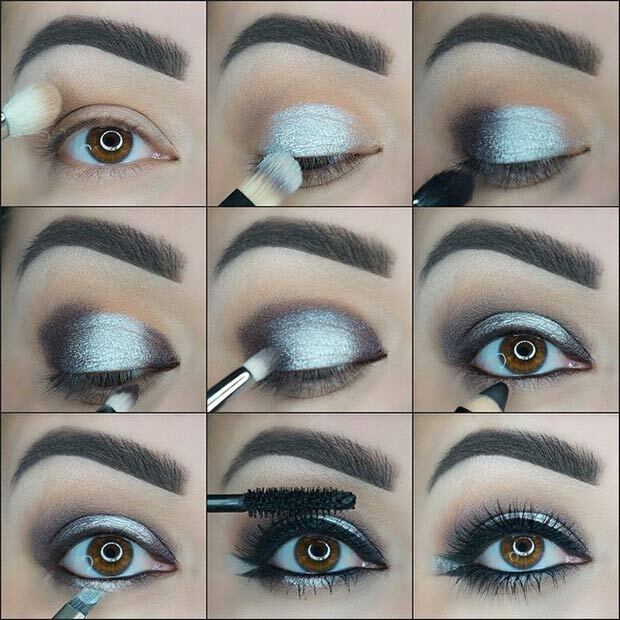 Pat a silver eyeshadow to the center of the lid. Step 3. Apply a black matte eyeshadow to the outer corner of the eye. Step 4. Apply the same shade to the inner corner. Step 5. Using a blending brush, connect the corners. Step 6. Line your waterline. Step 7. To brighten up the look, highlight the center of your lower lash line. 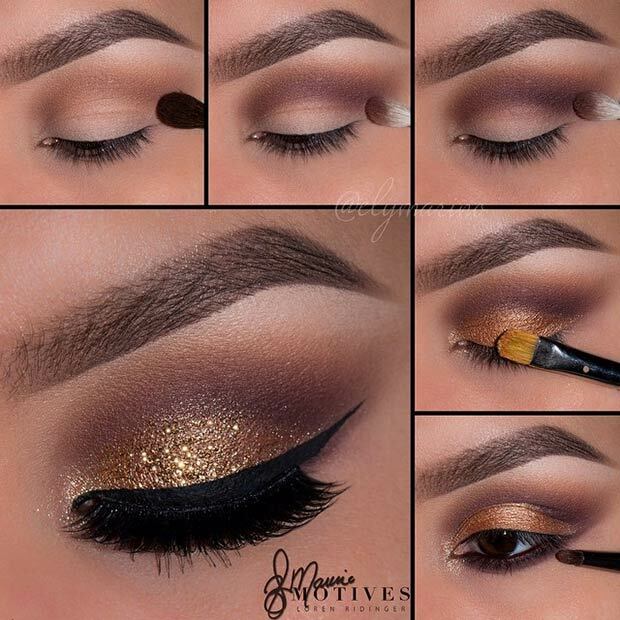 Use the eyeshadow from the step 2. Step 8. Apply an eyeliner along the lower lash line and mascara. Step 9. Finish the look with some partial false lashes on your upper and lower lash line. Step 1. Apply an eye primer and a purple eyeshadow as a base. Step 2. Highlight the inner corner with a shimmery eyeshadow. Step 3. Apply a black eyeshadow to the outer corner of the eye and along the lower lash line. Blend it to the crease. Step 4. Using a patting motion, apply a purple glitter. Step 5. Line your waterline with a black pencil. Finish the look by applying mascara and false lashes. Step 1. Start by applying an ivory or beige eyeshadow onto the brow bone. Now take a light brown eyeshadow and apply it slightly above the crease using a soft blending brush. Step 2. Build the color up by adding a chocolate brown eyeshadow. Step 3. To add depth and dimension, apply a dark brown eyeshadow in the crease. Use the same blending brush from the last step. Step 4. Apply a copper eyeshadow onto the mobile lid. Use a flat eyeshadow brush and patting motion. Step 5. Line the waterline with a black gel liner or pencil and smudge it out with a small brush and some dark brown eyeshadow. 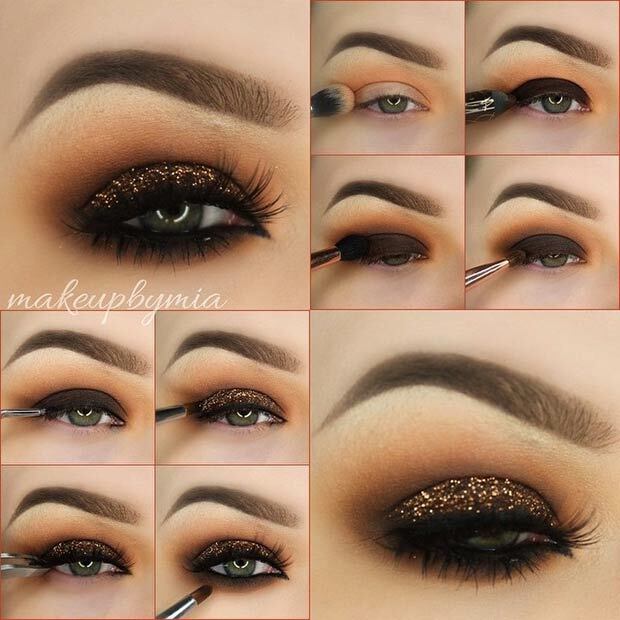 To sparkle up the eyes, apply a gold glitter pigment onto the lid. Finish the look with a winged eyeliner and false lashes. Step 1. Apply an eye primer and let it dry. Next apply a neutral eyeshadow, similar to your skin tone. This step will make your eye makeup last longer. Step 2. Why black base? 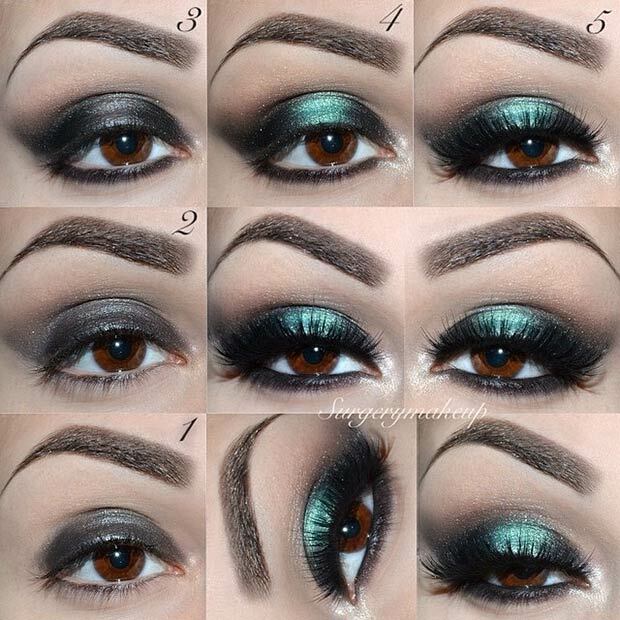 Black will bring out the hidden color in your eyeshadow and intensify it. 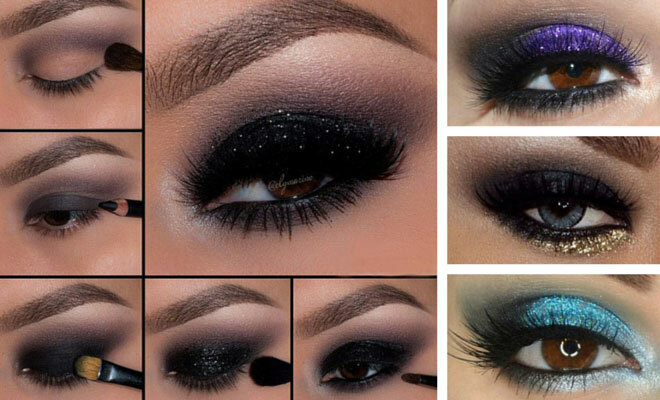 You can use black eyeshadow crayon, waterproof pencil or gel eyeliner – anything that’s black and long wearing. Step 3. Pat a navy blue eyeshadow onto your eyelid. Step 4. Apply a dark matte eyeshadow to the outer corner of the eye and blend! Step 5. Line your waterline with a black eye pencil. Step 6. Smudge the lower lash line using a small brush and some black eyeshadow. Step 7. Apply your favorite mascara. Step 8. Apply false eyelashes. Step 9. Finish the look by applying an eyeliner along the upper lash line. Step 1. First, highlight the brow bone. Step 2. Using a crease brush, buff a chocolate brown eyeshadow into your crease. Step 3. Blend the brown eyeshadow out using a peachy eyeshadow and blending brush. Step 4. Next apply a gold eyeshadow onto the eyelid. Step 5. 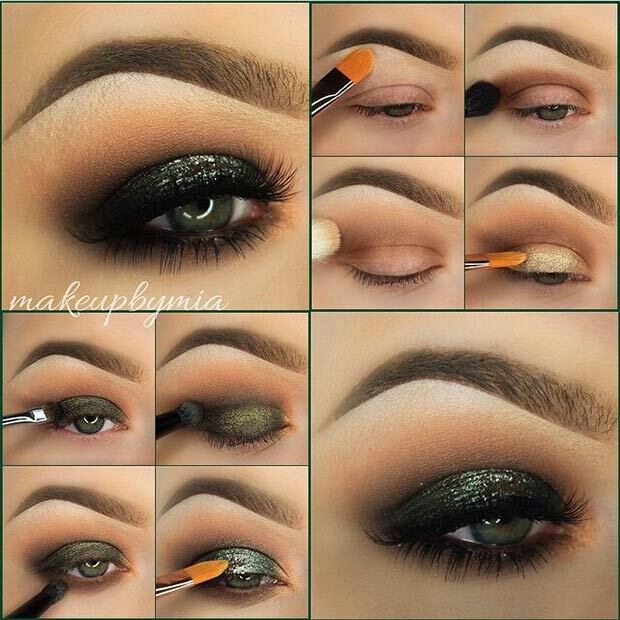 Build the look up by adding a sage green eyeshadow onto the gold shade from the last step. Step 6. Apply a black matte eyeshadow to the outer corner of the eye to add depth and dimension. Step 7. Apply and smudge a mixture of black and brown eyeshadows to the lower lash line. Step 8. Sparkle up the look by applying a glitter pigment to the center of the eyelid. Finish with mascara and false lashes. Step 1. Take a piece of scotch tape and place it as pictured above. Using a fluffy blending brush, apply a medium brown eyeshadow to the crease. Step 2. Next apply a reddish brown eyeshadow tightly to the crease. Use a smaller blending brush. Step 3. With a flat eyeshadow brush, pat a bright purple eyeshadow to the lid. Step 4. Blend, blend, blend! Step 5. Remove the piece of tape and highlight the inner corner. 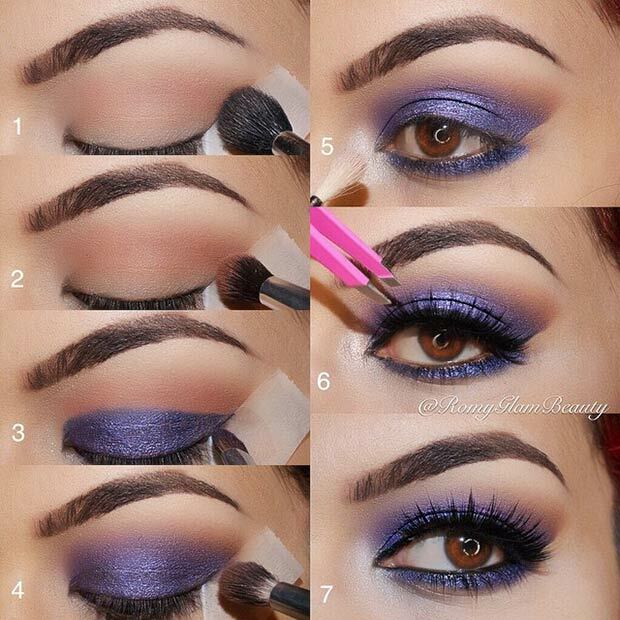 Apply the purple eyeshadow to your lower lash line. Step 6. Apply false lashes and winged liner. Step 7. Apply your favorite mascara to your lower lashes and line the waterline. Step 1. Start by applying a light pink eyeshadow into the entire crease. Use a big and soft blending brush. Next apply a pink eyeshadow just on the outer wing of the eye. Step 2. Apply a matte purple eyeshadow onto the entire lid. Step 3. 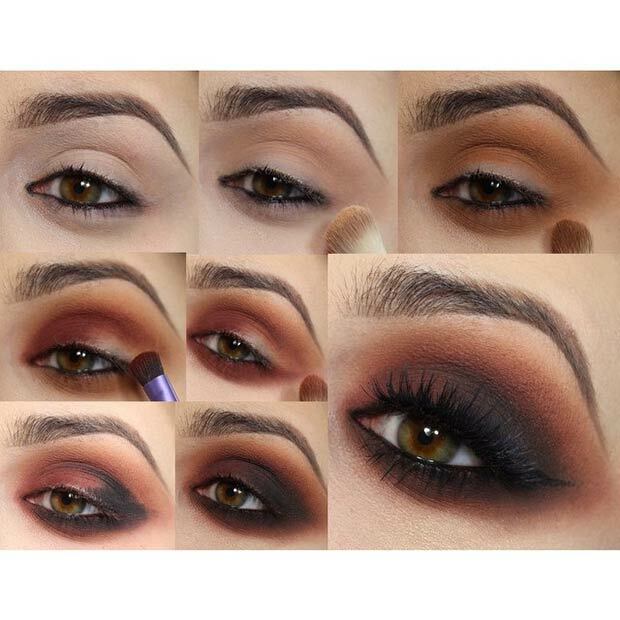 Create a cut crease effect using a black matte eyeshadow. This step will add depth and dimension to the eye. Step 4. Create a winged liner using a black liquid eyeliner. Step 5. Line your waterline with a purple eye pencil. 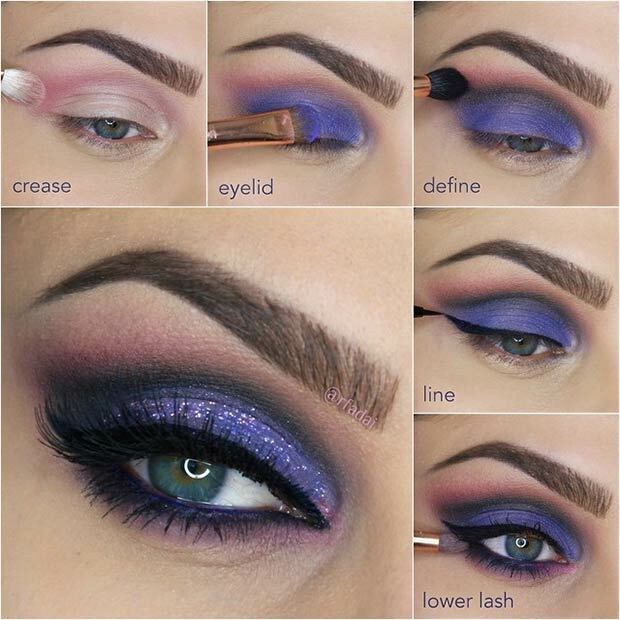 Apply a mixture of the purple and pink eyeshadow to your lower lash line. Smoke it out using a small, fluffy brush. Add mascara and false lashes. Step 1. Apply a thin layer of an eye primer and let it dry. Step 2. 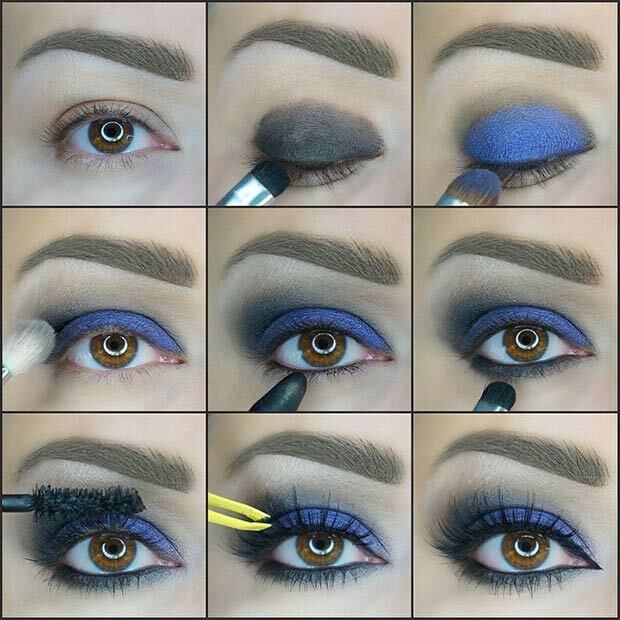 Using a big fluffy blending brush, apply a dark blue eyeshadow to the outer corner of the eye and blend it out. Step 3. Next, apply a white or ivory eyeshadow to the inner part of the lid. Use a flat eyeshadow brush. Step 4. Pat a vibrant blue eyeshadow to the lid. Step 5. 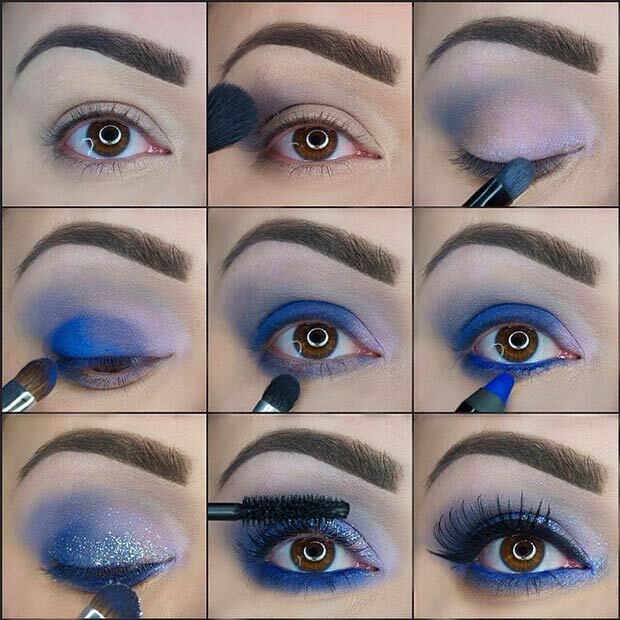 Apply a mixture of blue eyeshadows from the previous steps to your lower lash line. Step 6. Line your waterline with a blue eye pencil and smoke everything out. Step 7. To make that eye really pop, pat a light blue glitter onto the lid. Step 8. Apply your favorite mascara. Step 9. Finish the look with a pair of false lashes and winged liner. Step 1. Start by priming your lid with an eye primer and let it dry. Line the eye with a black eye pencil. Step 2. With a blending brush, apply a soft peachy or brown eyeshadow. Step 3. Build the color up with a caramel brown eyeshadow. Apply it with a smaller blending brush, and extend it high above your crease. Apply some to your lower lash line, too. Blend the shades together. Step 4. Next, apply a rusted red-brown eyeshadow onto the entire lid, leaving the outer part free. Step 5. Apply the same eyeshadow to your lower lash line and smoke it out. Step 6. Fill the free part of the lid with a black matte eyeshadow. Apply the black eyeshadow to your lower lash line. Step 7. Blend until your hand hurts! Step 8. Line your waterline again and apply false lashes.